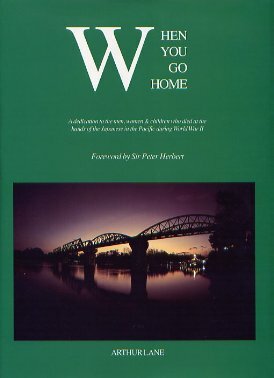 This book as well as being a dedication to the memory of those men and women who died during the Second World War in Malaya and Singapore and afterwards as prisoners of the Japanese, is produced so that the families of those involved in the conflict, might be able to glimpse some of the places which were just place names. Names like Three Pagoda Pass, Hell Fire Pass, Niki-Niki, Chungkai and others which conjure up in the mind some form of tropical paradise, but which in fact were stopping places to Hell. The book contains a condensed history of the fighting down through Malaya and the fall of Singapore. The return journey to the former battle sites and prisoner of war camps which were built along the Kwai Nai is dedicated to those who died there. There are approximately 200 photographs many of which were taken with much patience by Philip Cawley. A complete roll of honour in which all who were killed in action or subsequently died in the Japanese prison camps are listed under their respective Regiments/Squadrons or Ship. Arthur Lane enlisted in the Manchester Regiment as a drummer boy at fifteen years of age. Seeing service in Egypt, Palestine and Singapore, where in February 1942 he too became a prisoner of war, working with others on the infamous Bangkok to rangoon death railway. He sounded the Last Post over more than 3,000 of his former comrades and assisted in the disposal of many more Allied and Japanese soldiers immediately after the fall of Singapore. Since the war he has been a persistant campaigner for the recognition of his former comrades and for victims of Japanese atrocities. A quantity of brand new copies of this book have been donated to COFEPOW by the author for sale in aid of COFEPOW funds.